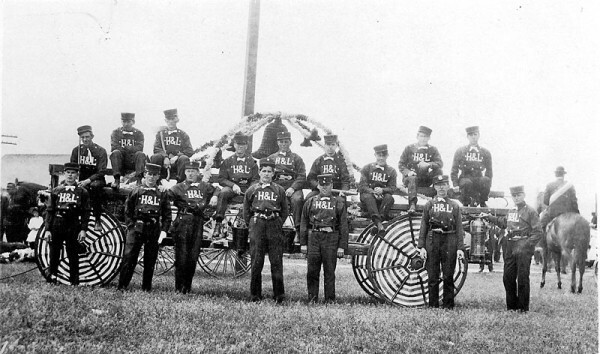 This wagon was the first apparatus acquired after the formation of the current fire department in 1897. It was built in Ferndale in 1898, and was stored at Nevens Stables. A new company was formed to man the wagon, and this became the Hook & Ladder Company. The Hook & Ladder company in a fire department was responsible for rescuing people from windows or providing access for firemen and tearing down walls with their long hooked poles, what we call pike poles today, only they were much longer. Construction was simpler and mostly wood those days, and with building often built right next to each, a main way of preventing the spread of fire was to pull down buildings that were on fire, or sacrifice the next building to prevent the whole block from going up. In 1939 this wagon was obsolete and was finally retired. With its retirement, the Hook & Ladder Company was dissolved, until 1949 when it was revived to man the 1949 International. The 1898 wagon is still owned by FVFD and is on display in the fire building at the Humboldt County Fairgrounds. The photos of it on a trailer are from May 1980, possibly while it was being transported to a muster in Cloverdale. After the wagon was “borrowed” by Fortuna’s fire department in 2010, it was last used to transport the flag pole from Valley Lumber to the new fire annex building when it was installed that same year. Mr. T. Mitchell, foreman of our Hook and Ladder Co., has presented the company with a new gong for the ladder truck cast by J.E. Armytage out of brass recovered from the wreck of the battleship Maine, which was presented to Mr. Mitchell by his brother, who obtained it from a friend below.